Do you see the stamp on the bottom right with the 4 circles? We will have a limited amount (about 100 or so) that we will be giving away as samples at CHA! So if you are going to the show, please come by and see us at Booth 1893 and pick up your free sample. I do want to say THANK YOU for taking the time to share what your favorite sets are, and why - the feedback is appreciated - and I'm upping the inventory on all the sets I think, based on all your awesome enthusiasm! We've signed with some rep companies and we are sure we will be more of your local stores, making it easier for you to get our products. Time for another share - this set is so delicious, there is no other word for it. The name makes me giggle too. Introducing... Frame-a-ma-bobs! The frames and the images inside the frames are totally separate (except for the frame in the bottom right) - so there's tons of different stamps in here for you to use. The scallops and damasks are just killing me right now. Love them. This set is brought to you by our fabulous digi designer Kate Teague. And look for a new product line that she's designed which we will debut at CHA in less than 2 weeks!! And, the winner from the last post is JULIE DETLEF! Congratulations Julie, you've won yourself a coveted set of Goes With - you literally are the 8th person ever to get this set. :) Congratulations! Please email me with your address! Yes, we are doing yet another giveaway today - tell me what you can envision yourself creating with the stamps from the Frame-a-ma-bobs set (here's mine: I am altering a gift bag and creating a coordinating tag with the damask stamps!). Post away until Thursday night 11.59pm PST. I'll pull a name on Friday morning and you get to choose what stamp set you'd like! I can definately see myself framing letters in a word, or framing initials on a scrapbook page. Very nice selection of new stamps! 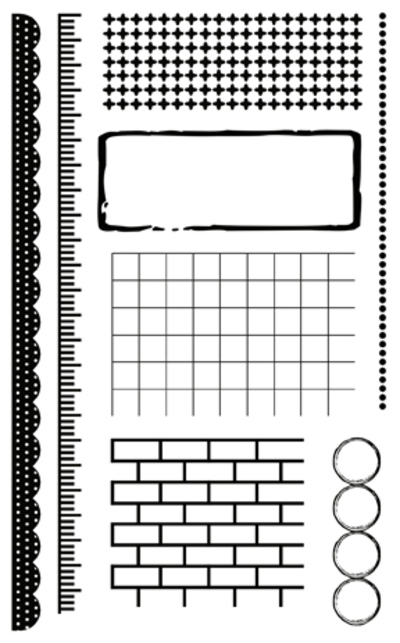 Those frames stamp are so awesome I would use them to make Little thought cards, I love to make thought cards to pop into my girls lunch boxes, bags etc with things to make there day even happier just like a simple i love you or you are the best and those stamps are just right for that, When will we get them in Australia??? Gosh, tags, cards, layouts, they would look great stamped on tiles!!! I love them!!!!! I just want to comment that I wish you would make more of the 4 circle stamp and make it available to the rest of us. Totally stinks though that I can never find them at my lss... Do you guys sell Fontwerks in Hawaii?? The possibilities are endless for these stamps but I can see making some GREAT frames and using them on an altered vase I'm making. Would be GREAT to do some heat embossing with those cute stamps!! These are so cute! 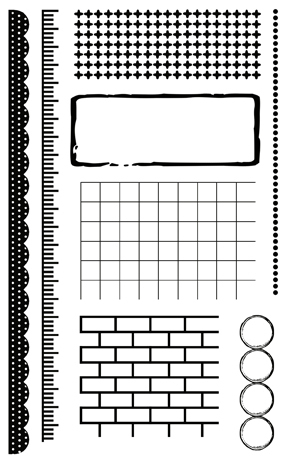 I can see them being used for photo corners, journaling spots, tags and SO much more! Wow. Love those new stamps!! 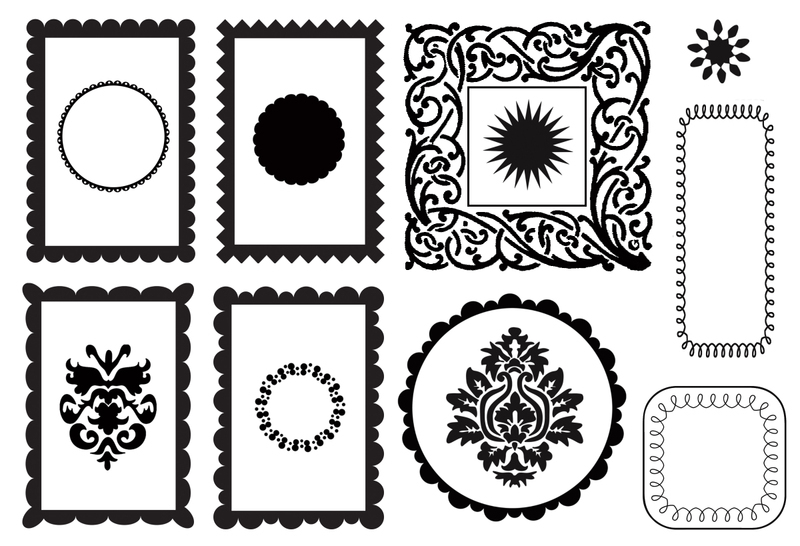 Since I'm mainly a card maker, I'm thinking of using the frames for journaling and around the main stamped motifs. The round frames for monograms (perfect for personalized stationary! 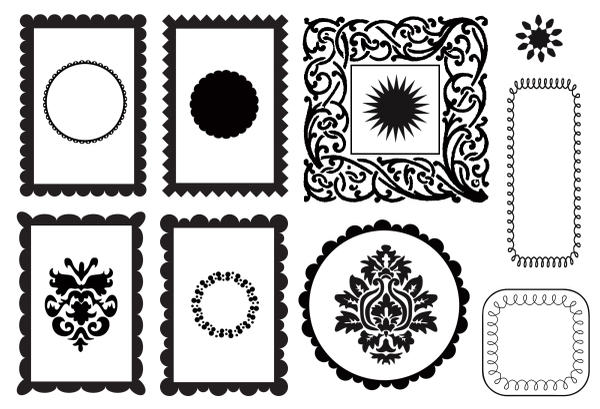 ), and the damask stamps for home made patterened paper. Wow! The stamps are brillant! Got my eye on a few!